Fall Quarter has consistently been the most popular term for Northwestern students to study abroad since the Study Abroad Office opened in 1997. 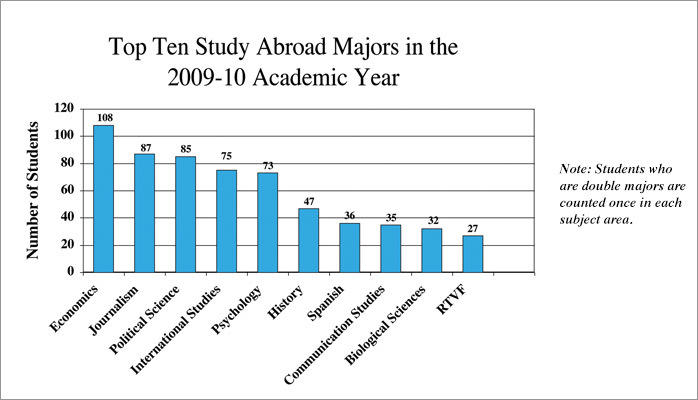 Full year study abroad has slowly declined (from 23% in 2000-01 to 5.8% in 2009-10) while summer study abroad has steadily increased (from 17% in 2000-01 to 33% in 2009-10), both of which are consistent with national trends. Europe continues to be the top destination for Northwestern students studying abroad, also consistent with national trends. The percentage of students studying abroad in Africa has grown from 3% in 2000-01 to 10.8% in 2009-10. The percentage of students studying abroad in South America has grown from 6% in 2000-01 to 16.5% in 2009-10. Korea has made the “Top 10 Study Abroad Countries” list for the past two years due to the increasing number of Korean citizens taking courses in their home country over the summer term.